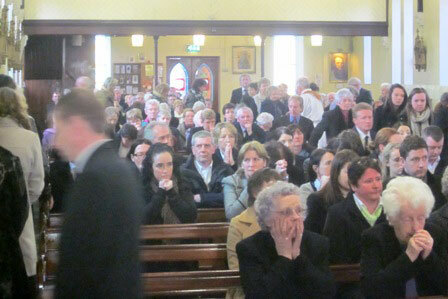 The SMA Provincial Leader, Fr Fachtna O’Driscoll, was the Principal Celebrant at the Funeral Mass for Fr Michael Cahill SMA at 12 noon on 18 February 2012, in St Joseph’s SMA Parish Church, Wilton, Cork. Principal concelebrants were two of Fr Michael’s classmates, Fathers Owen McKenna SMA and Martin Costello SMA and the retired Parish Priest of Craughwell, V Rev Fr Christy O’Connor. In the largest SMA funeral for many years, more than 50 other priests (SMA and Kiltegan) joined the large congregation to give thanks to God for the life of a good and faithful missionary priest. Michael Cahill’s living and dying was a strong reminder to us all that life is indeed mystery. How often had we declared that surely that night would be his last night on earth? How many times did his family return home from a visit with the thought that they would not see their brother alive again? And yet he lasted and lasted and lasted. A true reminder that God is the giver and taker of life. There is a time for every purpose under heaven. We are not the final deciders of when our life on earth should finish. It was a great blessing that his sisters, and his dear friends who cared for him with such great devotion, should all be with him in his last hours. Michael’s life and death reminds us very clearly that we are bodily creatures. More than most of us, he woke up each day of the last ten years conscious of his body. Since his accident that necessitated the amputation of his leg, he was clearly aware of the limitations bodily infirmities place on our life choices. But he accepted his situation with great serenity. I’m sure he was able to talk to his closest friends of the frustrations and suffering this paraplegic condition imposed on him, but he never allowed this to negatively impact on his positive attitude to life. In this way his life was a genuine inspiration to all of us. His broad smile, his ready chat, his willingness to engage in other people’s preoccupations rather than focussing exclusively on his own, were all beautiful expressions of the Christ we encountered in the other. Two recent articles in the Furrow magazine drew attention to a proper theology of the body. Blessed John Paul II has opened up for the church a new appreciation of the body and its significance for our life in Christ. His theology confined to history the negative dualism of the past where the body and spirit were seemingly opposed. It set the body firmly at the heart of our encounter with Christ through our encounter with our neighbour. Being a combination of earth and the breath of the divine, the body gives us a rootedness as well as a sacredness and dignity that can never be diminished. In a sense then we can say that the most spiritual place we can be is in our bodies. The Incarnation itself, God becoming embodied as human being, is the greatest witness to the sacredness of the body. 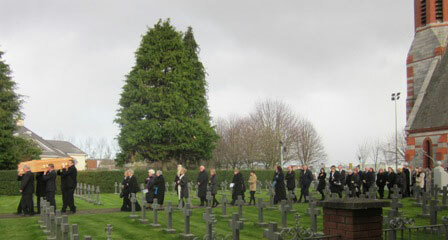 Each funeral is a reminder to us that we believe in the resurrection of the body, as we pray in our creed. We believe, then, that Michael will be reconnected with his body on the last day. How that body will be then we do not know. Will it retain the marks of suffering visited on it during the last ten years of his life? We simply don’t know the answer to that question. We know from gospel accounts that the resurrected Jesus has something of the bodily features of his earthly life but he was also different so that his disciples who had lived three years with him could not easily recognise him. St Paul tells us that our bodies are temples of the Holy Spirit. It is because of this that we must treat our bodies with care and dignity. Michael’s living in his body with such grace in these last years is surely an invitation to us to look again at the care and dignity that we give or withhold from our own bodies. Do we live in them as if they really were a temple of the Holy Spirit? Or do we rather treat them as an encumbrance that has to be merely tolerated? In our first reading from Isaiah, coming 700 years before Jesus Christ, the prophet proclaims a hymn of faith that death will eventually be conquered. “The Lord will take away the mourning veil…… he will wipe away the tears from every cheek; he will take away his people’s shame everywhere on earth, for the Lord has said so. ….. this is the God in whom we hoped for salvation”. That is a question that each of us has to answer for ourselves. 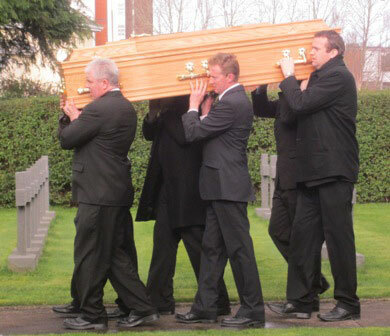 I have no doubt what answer Mick Cahill gave throughout his life. It would have been a simple and clear “Yes, I believe”. It was this simple but no less solid faith that also sustained Mick through his suffering. There is a proverb from Burkino Faso which states, Man has two feet but he cannot follow two paths at the same time. Whatever about Micheal’s two feet, it is good to focus for awhile now on his determination to follow just one path in life. He was born in Craughwell, Co Galway in 1936. He was always very proud of his native soil. Being the youngest of ten children I suppose it was inevitable that he would be something of a pet to his older siblings. Of course it was one of the lovely features of Michael’s personality that he attracted very strong and enduring friendships throughout his life. Today’s second reading from St John is so aptly chosen. It speaks to us of loving our brothers and sisters. Certainly, if it ever needed proof that Mick was loved by his brothers and sisters – not just the nuclear family but a wide circle of devoted friends – the last few years and especially last months revealed just how warmly Mick was held in the affection of many. The regular and frequent visits of his sisters, nephews and nieces, the extraordinary devotion of his very special and good female friends, the wonderful care from all staff members of SMA House, Blackrock Road and the affectionate enquiry of his health condition from almost anyone who had more than a brief encounter with him in life, is a fitting testimony to the love that Mick brought to so many people’s lives. Mick came from a home where prayer was a significant feature of every day. Vocations to the religious life were fostered in this home as in many of that era. Mick answered the call to a missionary vocation and joined his cousin John Haverty into the SMA. He was ordained with a big group of colleagues in December 1961. What a wonderful blessing it was that Mick was able to be present for the golden jubilee celebration of his ordination last year. He was assigned to Western Nigeria where he was to spend the next thirty five years or so working among the Yoruba people. He spent the first nineteen years in the diocese of Ondo, working in such beautiful sounding places as Owo, Okitipupa, Irele and Ondo town itself. He was a solid, dependable, efficient and effective missionary. He was always pleasant and was a great host. He was noted as a good man to train a new priest. He gave special attention to schools – both to the physical structures as well as the care of the students and teachers – and was generous with his help to other religious in the missions around him. His work in Ondo town was recognised and deeply appreciated by the local people; they conferred on him a chieftancy title of ‘Bashorun of Ondo’. In 1982 he answered a call to spend some time on the ‘home’ mission and so took up the post of Director of the Family Vocations Movement in Munster. Mick’s gifts for friendship were particularly put to good effect in this ministry. Not only did he continue the strong financial support for the training of missionary priests but he also established some enduring friendships. Many of these friends came to see him during his illness. In 1998 he returned to Nigeria and began a similar work to raise funds locally in Nigeria for the training of African students for missionary priesthood. Shortly after this he was elected by his confreres to be their deputy Regional Superior. On finishing this post he took up the responsibility of establishing a new SMA parish in Iloring, Nigeria, at Gaa Akanbi. He was still in this post when the accident happened during his holiday in 2002. But even the accident and the limitations it imposed did not stop him from contributing to SMA mission. After a lengthy recuperation he again took up an appointment in the promotion office. This allowed him to re-acquaint himself with many he had met during his years as FVC director. So, Michael has finally gone home to God. His parting was certainly a long struggle. We believe he is with God in a new way. All the love and affection that knit us together in life does not unravel with death. We pray that Mick’s inspiring life will move us to be more loving people.